* 24 hrs notice is requested for all cancellations or fee will apply. Please check with your health provider to see if your plan covers you for your Complementary Therapy. I am registered with VHI, Quinn Health & Aviva. Please arrive on time to ensure you receive your full treatment. Aromatherapy products available for sale also on request. You Can Heal Your Life 2 Day Workshop, 16th/17th September 2017, 4 Adelaide St, Dun Laoghaire, Co. Dublin. You Can Heal Your Life 2 Day Workshop, 30th/31st July 2016, I Haigh Terrace, Dun Laoghaire, Co. Dublin. I Haigh Terrace, Dun Laoghaire, Co. Dublin. You Can Heal Your Life 2 Day Workshop, 25th/26th July 2015, I Haigh Terrace, Dun Laoghaire, Co. Dublin. You Can Heal Your Life 2 Day Workshop, 12th/13th Sept 2015, Angel World, 2 Hyde Bridge, Sligo. 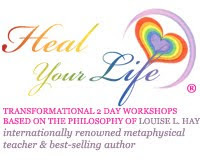 You Can Heal Your Life 2 Day Workshop, 9th/10th May 2015, I Haigh Terrace, Dun Laoghaire, Co. Dublin. You Can Heal Your Life 2 Day Workshop, 28th Feb/1st Mar 2015, I Haigh Terrace, Dun Laoghaire, Co. Dublin. Angel World, 2 Hyde Bridge, Sligo. Loretta is a Licenced & Certified Heal Your Life Workshop Facilitator & Coach. She assists people to manifest their full potential and live a life of their dreams. Loretta is a highly qualified Reflexologist incl Subfertility, Pregnancy & Palliative Care Reflexology, Aromatherapist, Holistic Massage & Indian Head Massage Therapist, TM Reiki/Sekheim Master & Teacher. Physical & mental stress can manifest in many ways affecting the body, mind and spirit. People are turning to complementary therapies more now as they are not getting full satisfaction & results from conventional medicine alone. A combination of the two appears to be the key for many and much research has been conducted by professionals to support this. This is evident now as Health providers namely VHI, Quinn Healthcare & Aviva offer partial cover depending on your Health Plan on certain complementary therapies for example Reflexology & Massage. These therapies are also used in many Hospitals, Care Homes, Hospices, Mental Health Institutions & in the Corporate world.